Political Spin Removal: Is The Republican Party Doomed? The Senate passed its version of a health insurance bill just before Christmas. Much of that victory belongs to Senate Majority Leader Harry Reid who somehow managed to get the 60 votes needed to stop Republican obstructionism. That must have been harder than herding kittens with a stick. There are reports that the senate legislation contains considerable pork benefitting individual senators in exchange for their votes. So be it. That’s how it must be done in a less-than-perfect world. Reid deserves a medal. On the other hand, what is up with Republicans? Their obstructionist behavior proves that they are motivated to make the Democratic party fail, regardless of what is right or wrong. Not a single Republican vote was cast for health care reform in the Senate. Not one. How can ALL Republicans be in the pocket of insurers? How can every one of them be without compassion? How can 100% of them be contemptuous of the needs of the people they supposedly represent? It is unfathomable. It’s not that they wanted more debate; they wanted to shut down all debate. They are simply petulant obstructionists, like a child who threatens to hold his breath until he gets his way. The Republican party has become morally, ethically, and intellectually bankrupt. I am sure that as soon as the legislation is reconciled and passed, they will begin campaigning for its repeal. If Dems have any sense of public relations (and they often don’t), they will start framing their victory message now to inoculate the public against the unconscionable Republican hypocrisy inevitably forthcoming. At some point, even the most ignorant of American voters surely will realize that the Republican party is the party of small-minded greed, selfishness, and immaturity. It will become patently obvious through the party’s bizarre, unjustifiable antics. Won’t it? There must be a bottom to the well of ignorance. This health care reform episode might illuminate that bottom if the Democrats play their P.R. cards right. I will not be too surprised if, within a decade, the Republican party is defunct, replaced by a new political party, The Conservatives, or something like that, made up of lawmakers who are responsible to the American voters, who do have conscience, ethics, and ideas, but who, unlike Republicans, would like to seriously and honestly engage American voters about important issues such as excessive government spending, and have the courage to stand for election based on their principles. They will become strong. 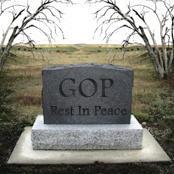 The GOP will be no more.